Tooonoo attributes the development of himself as a carver to his maternal grandfather Quppapik who used to provide for his family through hunting and carving. As a boy, Toonoo would watch his grandfather Quppapik and learn how his grandfather made carvings. Watching is how Inuit learn from there forefathers to survive. In 1979, Sharky, Toonoo’s paternal grandfather, and Toonoo’s father Josephee both passed away tragically in a boating accident when Toonoo was nine years old. After this event, Ragee, his mother, and the children moved to Kimmirut (Lake Harbour). It was in Lake Harbour that Toonoo started his carving career at the age of nine and into his early teens. The family moved back to Cape Dorset when Toonoo was 13 years old. He continues to carve and gain mastery over the stone with new tools and techniques. He was already supporting himself in his teens through carving. Not having his Father or Grandfather to look after him, he says, made him the master carver he is today. He learned to survive through his art. What he is going to carve comes from the spirit in the stone and his spirit, his mind and his imagination. His mastery of capturing spirit in stone continues to captivate an audience for his work. Changes to his style are a natural development. His work today features different coloured serpentine stone for eye inlays. In the past the eye inlays have been either ivory or caribou antler with dark serpentine. 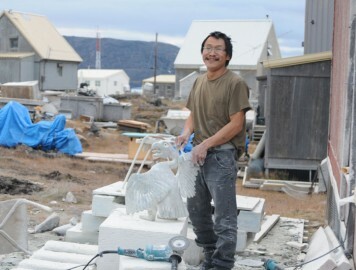 He carves mainly large scale sculptures. He sometimes takes the stone to its limit carving it thin, as thin as he can, making pieces fluid and transforming. Birds continue to be a favourite theme. Birds, fish, Shaman, transformations and masks have shown themselves in the stone.